Russian President Dmitry Medvedev on Monday assured Prime Minister Benjamin Netanyahu that it would hold off on its contract to sell an advanced air defense system to Iran. Israel has repeatedly asked Russia to scrap its contract over the sale of the S-300 system to Iran. Netanyahu said he had received assurances from the Russian leader during their talks on Monday that Moscow understood the seriousness of the issues involved for regional stability. "On this issue Russia is taking into consideration the needs for stability in the region," Netanyahu told reporters. The truck-mounted S-300, which can shoot down hostile missiles or aircraft up to 150 km [90 miles] away, could help Iran thwart any attempt by Israel or the United States to bomb its nuclear facilities. An hour before Netanyahu's plane took off on Sunday, Russian officials said that Moscow sees no reason to delay the sale of the S-300, a powerful air-defense system, to Iran. In addition, on Friday, Russian intelligence officials leaked comments expressing their displeasure with plans by an Israeli firm to close a major arms deal with Georgia. "There is a signed contract [for the S-300 missiles] which we must follow through on, but deliveries have not started yet," Vladimir Nazarov, deputy secretary of Russia's Security Council secretary, told Interfax news agency in an interview. "This deal is not restricted by any international sanctions, because we are talking about deliveries of an exclusively defensive weapon." Nazarov added that a military strike on Iran would be a big mistake and that the problems linked to Tehran's nuclear program must be resolved by diplomatic means only. "Any military action against Iran will make the situation explode and will have extremely negative consequences for the entire world, including for Russia, which is a neighbor of Iran," he noted. The Russians for their part stand to gain tremendously on the economic side in this air defense deal with the Iranians. The Russians would profit plenty and Iran would gain a strong deterrent against any future attack against it's nuclear facilities. For this reason the Iranians have tried repeatedly to get Russia to fulfill the deal. Russia stated that they needed the money from the deal due to the current economic crisis and even suggested that perhaps a different buyer could be found. On another note, the Russians for their part are not happy with Israel as the Jewish state has been recently helping to arm the former Russian republic of Georgia, which had a military confrontation with Russia not long ago. Israeli companies for their part have been moving past UAVs, which are seen as defensive weapons, and moving towards selling offensive weapons like rifles, RPGs, and other weapons which has angered the Russians. For students of Bible prophecy, the sale and delivery of S-300 air defense systems to Iran would be a huge red line crossed in the sand for Israel. Israel so far has not attacked Iran due to the desires of the international community to continue on the diplomatic track and to give sanctions that are currently being applied to Iran time to work. However, the Israelis as well as Bible prophecy watchers know that the current sanctions have had little to no effect on the ruling regime in Tehran. One thing that concerns me regarding the Russian government is that they are simply not trustworthy. The Russian government has shown time and time again that they can't be relied upon when the chips are down. They really seem to care very little when it comes to the safety and security of the rest of the world. The same can be said for China. These two countries will usually put economic interests first. Since Iran has already paid for the S-300 systems, it stands to reason to me that the Russians will in the end complete the deal with Iran regardless of what they have told the Israelis. When they do this appears to be up in the air, but I believe that the Russians will honor the deal as they are extremely desperate for cash to fund their military companies. As a result, it would seem to me that one day we will will find out that the Russian S-300 system is on it's way to Iran or that it is already there. Whether Israel will allow the systems to be put into operation before striking remains to be seen and that is currently the $64,000 question. 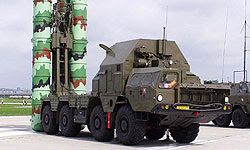 I would hope that if the Russians do go ahead with the sale and delivery of the air defense system, that the US and Israel would go ahead and strike the Iranian nuclear program before they have had a chance to setup the system and thereby try to carry out the Iranian dreams of the destruction of Israel in a nuclear holocaust. But we know from the Bible that Israel will not be destroyed again, so something has to give along the way. And whatever that may be, the bottom line is that the world simply can't afford a nuclear Iran. Please join with me in praying for the peace of Jerusalem.